Something old, something new, something borrowed, something blue… If you’re on the hunt for that bit of newness for your big day, don’t overlook a piece of costume jewellery. Experimenting with more fashion-forward pieces is a great way to inject a shot of modernity into your bridal look while showing a bit of your personal style. If you’re someone who rocks statement earrings most days, why settle for tiny pearl studs on your big day? Meanwhile, if your dress is understated, an abstract necklace or a brooch loaded with pearls can add a memorable twist. Heirloom jewellery is wonderful to have, but its absence doesn’t mean you can’t start your own traditions. A little imagination is all it takes to turn something into a keepsake with history. So scroll through the exquisite pieces below and think about experimenting. 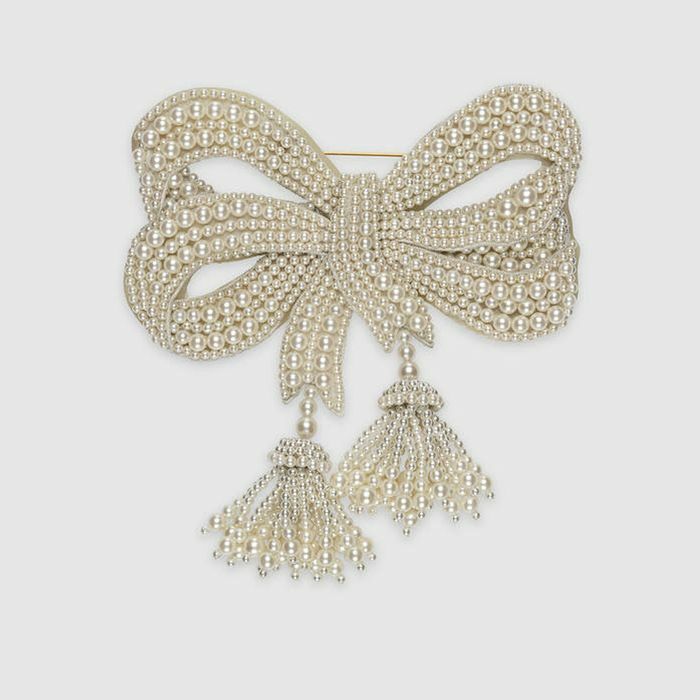 Pearl dreams are made of this Gucci brooch—a must for adding a touch of wow to a simple gown. Let these dramatic tassels brush your collarbone. They’d look stunning with an off-the-shoulder dress. If your wedding jewellery is rose gold, treat yourself to this pretty bangle to extend the theme. Too good to save for just one day. These abstract beauties demand a monumental occasion to shine proudly. Yes, you can rock an ear jacket down the aisle. You could also wear the studs to the ceremony and then add the back section for the reception and beyond. These ingenious studs can be worn with the giant pearls facing to the front or the back (depending on what best suits your dress). This hair slide looks like a brooch, but it is, in fact, an exquisite piece of adornment for an updo. Don’t forget to adorn your wrists. This asymmetric cuff is simply stunning. A headpiece like no other: A gold-covered band leads to beautiful silk flowers that drop from around the ears (perfect for hair worn down). Edgy ear cuffs with a dainty twist are more than suitable for traditional nuptials. A modernist cuff will look great against simple lines. These huge hoops reinvent traditional pearls. Next, see the over-50 women with ridiculously enviable style.